LovBun is a love bunny who lives on hugs. 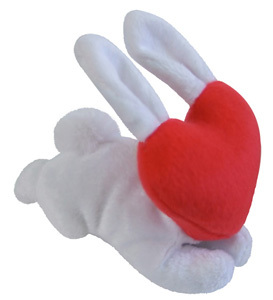 LovBun came from a distant planet to bring love and hugs to people on Earth... like you! LovBun is a master of disguise, and can only be seen by those with a pure heart. His favorite hiding spots are in laundry baskets and under the covers. If you need a hug, LovBun is there for you. Even if you need two or three, or fifteen million zillion! At LovBun's hug café, the menu includes: baby hugs, bear hugs -- even bouncing bunny hugs! The daily special is always a gentle hug that makes you feel good from the inside out. Always remember to hug your LovBun every day!